Amelia has literally stunned audiences across her native Teesside with her pitch perfect, versatile voice and passionate, distinctive renditions of classic Indie, pop, new-wave and punk. Come and join us! This is a great location to meet new people and be entertained in a friendly and relaxed environment. Live music at the King's Arms is the perfect environment to chat to some great new people, have fun and get to familiar with the latest in live talent. 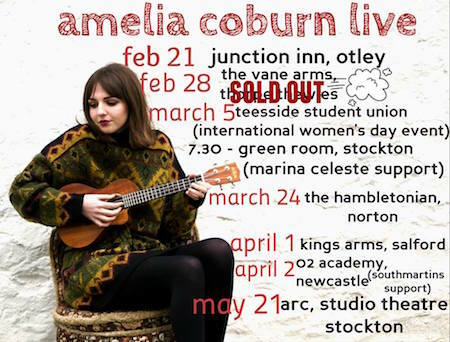 Amelia has literally stunned audiences across her native Teesside with her pitch perfect, versatile voice and passionate, distinctive renditions of classic Indie, pop, new-wave and punk songs. All on a ukelele. When The Southmartins brought her to The Kings Arms as a support recently the response was equally haunting. Without giving too much away if you're a fan of David Bowie, Kate Bush, The Specials, The Smiths and, well, just generally brilliant songs and artists then you will not be disappointed with this, Amelia's first headline spot at the venue. Be there just so you can say you were when she goes supernova. Slightly longer in the tooth, and as you might have guessed, Old Red Eyes is a tribute to the songs of Paul Heaton (You may have heard of him). A side project of the aforementioned Southmartins - lead singer Andy strips the songs back to just an acoustic guitar and his voice (with occasional loop-pedal based witchcraft). For this support spot with Amelia, Andy has promised to dig deep to deliver live versions of rarely heard songs from the Housemartins, Beautiful South and Paul's solo career as well as a few very well-known hits and bits. Passion is, again, the order of the day though and Andy will undoubtedly get a "3 song sweat on" despite the intimate nature of the performance.